The Lincoln Highway Forum, published quarterly, is the official journal of the Lincoln Highway Association. 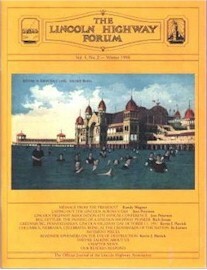 Members of the Association receive each issue of The Lincoln Highway Forum as a part of their membership privileges. To subscribe to The Forum, join the Lincoln Highway Association. You can browse indexes for issues of the Lincoln Highway Forum up to Volume 25, Number 2 (2018). Although the issues covered in the original index are also covered by the updated index, the topics are indexed somewhat differently.